Work to add all the Library’s printed materials to our online catalogue continues, reaching into some less visited corners of the collections. In the angle of the reading room gallery sits a collection of Quaker texts translated into foreign languages for use in the mission field. Among them are various volumes of early 20th century Chinese books and pamphlets translated by one Isaac Mason (1870-1939). Early Quaker works had been translated into Latin, Dutch, French, Hebrew, Polish and even Arabic, for diffusion throughout Europe and the near East. In the 19th century many works began to be translated into Scandinavian languages, and the Society of Friends’ annual epistle appeared in German translated by the Recording Clerk himself. Isaac Mason was responsible for the earliest transmission of Quaker writings to a Chinese audience: his career as a missionary and translator is a fascinating one. Isaac was born in Holbeck, Leeds, in January 1870 and joined Quakers through his connection with the Great Wilson Street Sunday School and Adult School. He proved “headstrong and difficult”, a thorn in the side of the staff, but, on the point of being expelled, he came under the influence of Caroline Southall in the Adult School and became intensely loyal to her. She and other Leeds Quakers offered their service with the Friends Foreign Missionary Association (FFMA) in China. Mason volunteered too, but was only accepted a year later. After a further year of working as an iron moulder in Leeds and studying in his free time, he moved to London, where he started work at the Barnet Grove branch of the Bedford Institute, became engaged to Esther L. Beckwith, and finally went out to join the FFMA in Chungking (Chongqing) in 1894. He and Esther settled in T’ung Ch’wan, Szechwan Province (Tongchuan District, Sichuan) and did pioneer work at She Hong and Suining. Together they passed safely through some turbulent times – local riots, the anti-missionary Boxer Uprising and the Revolution of 1911 (Xinhai Revolution). Isaac Mason or Mei I-seng as he was known in China, mastered the language with unusual quickness. After 22 years in West China, he moved to Shanghai, where his interest in the production of Friends’ literature in Chinese flourished. He translated for the Christian Literature Society of China short lives of Quakers such as William Penn, John Bright, John Howard, Stephen Grellet and parts of John Woolman’s Journal. He also tackled Sir George Newman’s Health of the state, dozens of religious books and pamphlets and helped compile a Chinese dictionary of the Bible. Many of his pamphlets reflect his interest in Islam in China. Among the children’s books are The Swiss family Robinson, and Lamb’s Tales from Shakespeare. 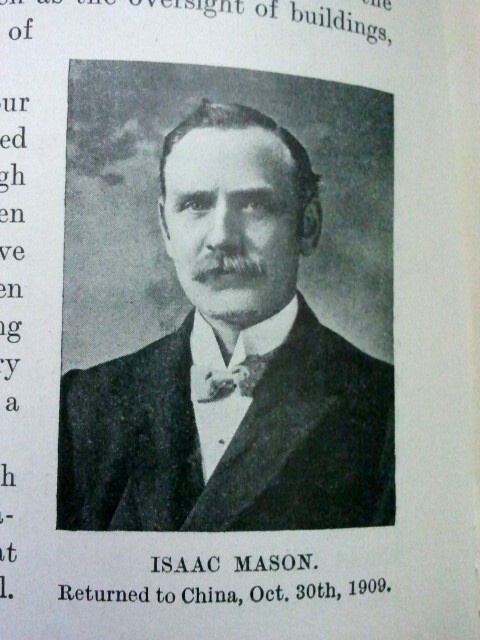 Like some other contemporary Christian missionaries Isaac Mason had a particular interest in Chinese Muslims, and he was elected as a Fellow of the Royal Geographical Society in 1921. 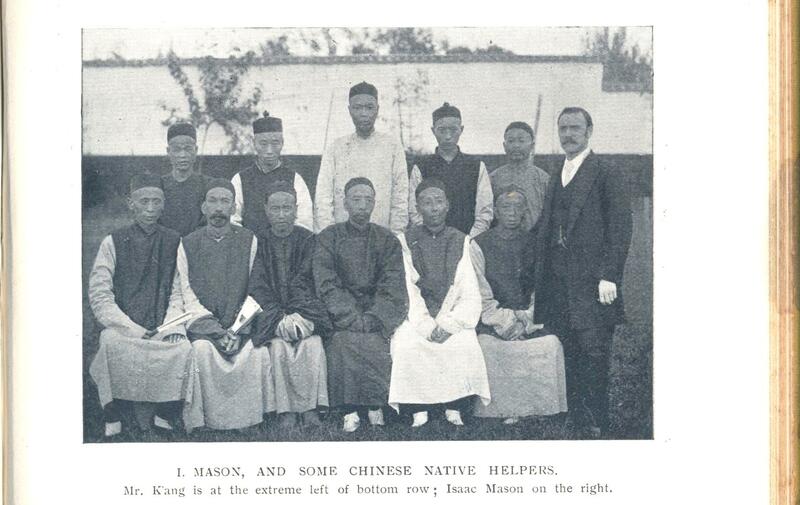 His election proposal stated that “Mr Mason has spent many years in China, travelled in the interior, investigated Chinese Mahommedanism, is the Secretary of the China Branch of the Royal Asiatic Society, and is in every way eligible for election as a Fellow. He is the author of several books in Chinese and English” (proposed by Zwemer and seconded by Heawood, the RGS Librarian; thanks to the Royal Geographical Society Library for this information). One of the bonuses of this Library’s retrospective cataloguing project has been the opportunity to provide better catalogue entries for foreign language publications – often poorly identified in the former card catalogue, or simply not catalogued at all. 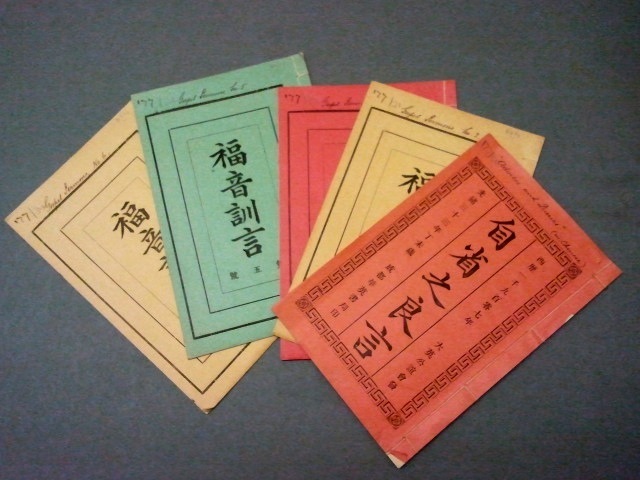 In adding this small collection of Chinese tracts to our online catalogue we faced considerable linguistic challenges. We did have help though – sometimes the original English titles were printed in English on the reverse of the title page, and occasional manuscript notes on the items themselves were invaluable. A few had explanatory notes from Isaac Mason himself. Though cheaply produced, the books and pamphlets are delightfully different from their English equivalents. 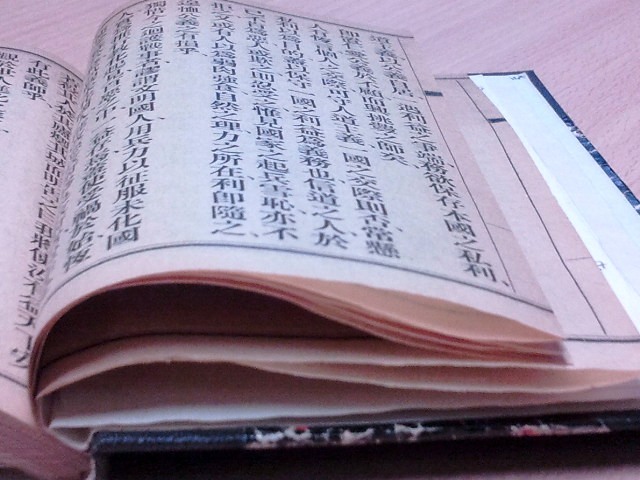 In many of them, each “leaf” is in fact a single sheet printed on one side only (as was traditional in Chinese book production), to make two “pages” of text with bold black borders, then folded in half to make a double sided page. This entry was posted in Highlights and tagged China, Isaac mason, missions, printed works, Retrospective Cataloguing Project. Bookmark the permalink. Thank you for this fascinating post on Quaker translations and the work of Isaac Mason in China. 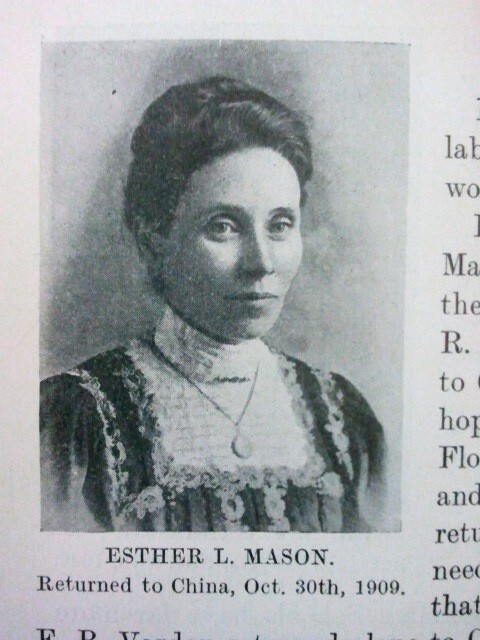 Whatever one thinks of the missionary movement, it threw up some remarkable individuals and Mason was certainly one of them. If he actually mastered written Chinese to the point that he could translate from the original English, as opposed to working through a bilingual Chinese assistant, that was a major achievement. 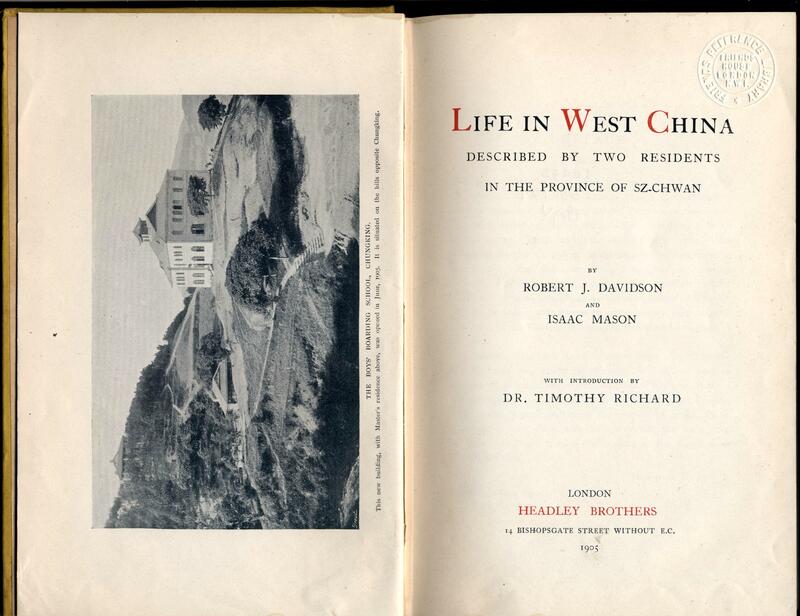 What is also impressive about LIFE IN WEST CHINA, his book of 1905 written with Robert Davidson is that it does not merely dwell on the work of the missionaries but is a perceptive and affectionate account of the lives of people in Szechuan province in general. He would be gratified to learn that today there is a genuine interest in the pioneering work that was done by foreigners in China at that time. On my recent visit to Szechuan researching the work of the Friends Ambulance Unit “China Convoy” I was very warmly received by the director and senior staff of Suining Hospital, another foundation of the Davidson family. As they approach their centenary, I was able to refer them to Charles Tyzack’s book which has helped them to reconstruct their early history. I merely opened a door for them but their gratitude and generous spirit was without bounds. That China is interested in rediscovering its past and its contacts with foreigners adds strength to my determination to bring my book on the “China Convoy” to publication. It is a story that again needs to be told and not be forgotten. 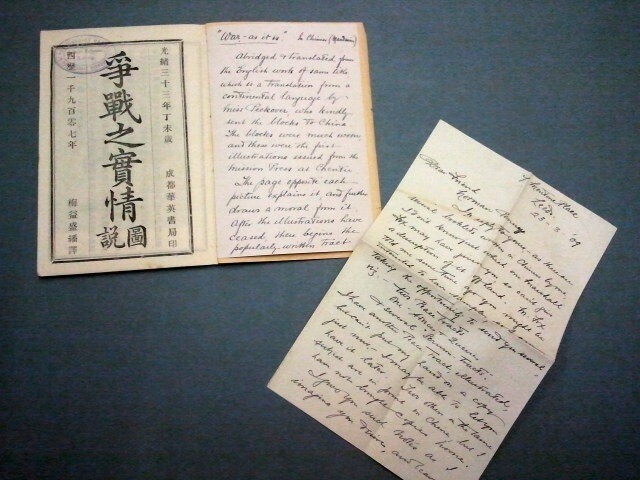 Have just been reading a compilation of my grandparents, John and Dorothy Rodwell’s letters to each other in China – they were often separated – and to family. It’s hair- raising stuff! They were in China at the same time as Isaac Mason. I have an illustrated book of Bible stories with Chinese sub-titles they used for teaching. My brother has one of the satin inscribed Suining scrolls given to Leonard Wigham and John Rodwell after the Suining incident. The other is supposed to have been given to the Penn Club! Their son Henry Rodwell was on the China convoy. Thanks for the comment Meg. China mission: the adventures of John P. and Dorothy Rodwell and their family while working with the Quakers in China (1986) is a fascinating account of their experiences. You’ll be pleased to hear that Charles Tyzack’s biography of Clifford Stubbs Nearly a Chinese (Book Guild, 2013) has just come out, if you haven’t already seen it – we are getting two copies for the Library. It includes a wonderful account of Clifford Stubbs playing cards with your grandparents at Qinlonggai – and his awkward attempts to justify that form of recreation!